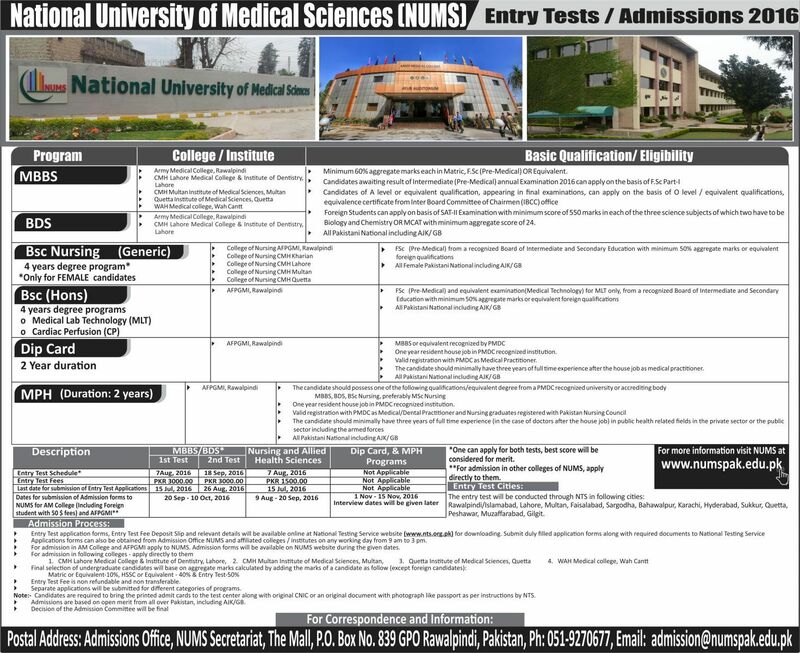 National University of Medical Sciences (NUMS), Rawalpindi Admissions 2016. NUMS was granted charter in 2015. It is envisioned to grow as a center of excellence for the country’s medical progress. An outstanding feature of the University is that while maintaining traditional values of excellence in teaching and research, it challenges conventional practices and creates new ways of developing and delivering courses, pertaining to emerging and cutting-edge disciplines, on most modern lines. The programmes are distinctive for their high-quality research orientation. Creativity and innovation are embedded as core values in all scholastic activities. NUMS has developed linkages with international universities of repute to ensure a two-way flow of knowledge and to be in step with modern trends. Split programmes and visits of eminent professors from reputed foreign universities is a regular feature of the academic activity. These eminent scholars deliver lectures on the latest developments in their respective fields and also help update and review the academic programmes. This is a generic test applicable to the constituents and affiliated medical and dental colleges. 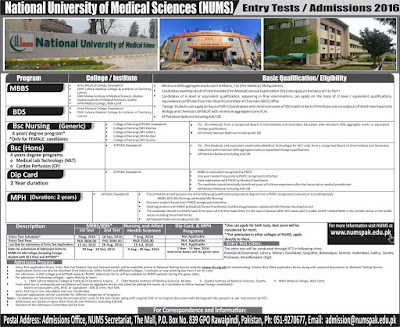 After the entry test, Candidates will apply directly to the medical Colleges / Institutes with NUMS Entry Test score. --Minimum 60% aggregate marks each in Matric and HSSC / equivalent exams. --Candidates of FSc (pre-medical) stream can apply for NUMS Entry Test on the basis of FSc Part-I but confirmation of admission is subject to the provision of FSc certificate or Detailed Marks Certificate. --Candidates of A Level or equivalent qualification can apply on the basis of O Level (SSC) equivalence certificate obtained from Inter Board Committee of Chairmen (IBCC) office but confirmation of their admission is subject to the provision of A Level (HSSC) equivalence certificate. --Foreign Students can apply on the basis of SAT-II exam (minimum score 550). However, foreign students can also undertake NUMS entry test in lieu of SAT-II. SAT Score Valid for two years. Entrance Test will be according to F.Sc/A level syllabus in Biology, Physics, Chemistry and English. MCQs based (no negative marking). NUMS Entry Test date First Sunday of August (7th-August-2016) & Third Sunday of September (18th-Sep-2016).